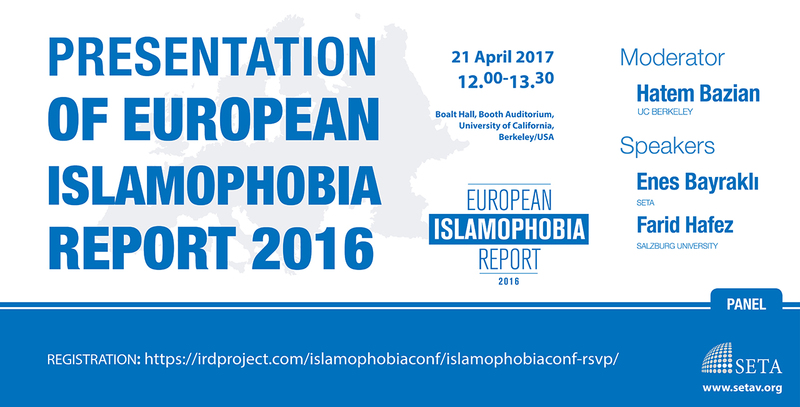 On April 21, 2017 SETA will organize a side-event on the presentation of European Islamophobia Report 2016 at the University of California during the “8th Annual International Conference on Islamophobia: Islamophobia and the End of Liberalism” organized by University of California Center for Race & Gender within the context of “Islamophobia Research & Development Project” between 21-23 April 2017. In this side-event, the findings of the report and the events related to Islamophobia happened so far in European countries will be discussed. Panelists of the side-event include the editors of European Islamophobia Report 2016 Dr. Enes Bayraklı from SETA and Dr. Farid Hafez from Salzburg University.